My best friend Chelsea posted a funny picture a few nights ago: a cereal box with a spoon in it captioned “no milk, college style living”. We really are one in the same! My work schedule has been pretty intense and my food regimen has been suffering, to say the least. No, that doesn’t mean that I’ve been eating fast food and chips every day- but it has put me in what I call a “convenience rut”. During the week,I eat what I have at home and what is quick, period. For example, the past three mornings my breakfast has consisted of Kashi cereal and frozen mango chunks doused in almond milk with a side of coffee to go. It’s good. It works. I’ll have more time soon, I swear. In any case, I was craving something different this morning, and I created what I would like to call a perfect smoothie combination. Three claps for me. I even used a few new product purchases! 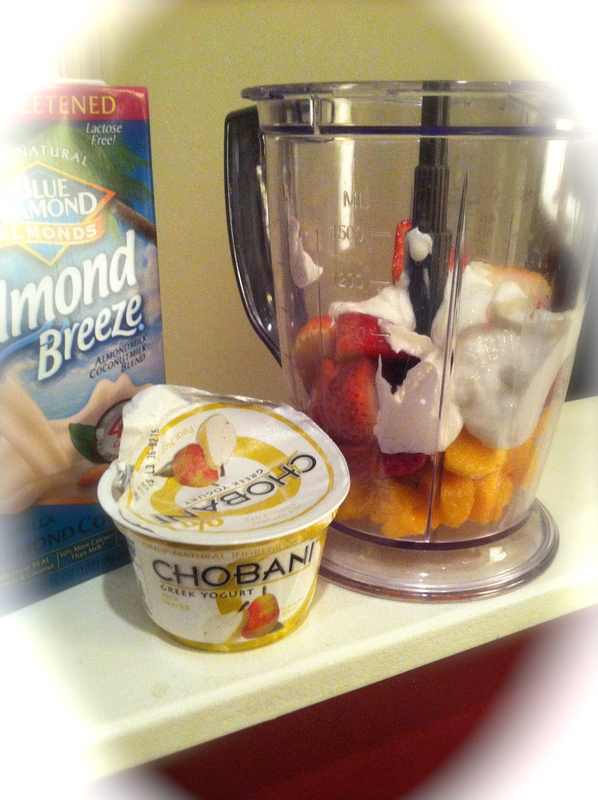 Chobani 0% Pear & Almond Breeze- Unsweetened Vanilla Coconut flavor. The name leaves so much to the imagination… doesn’t it? 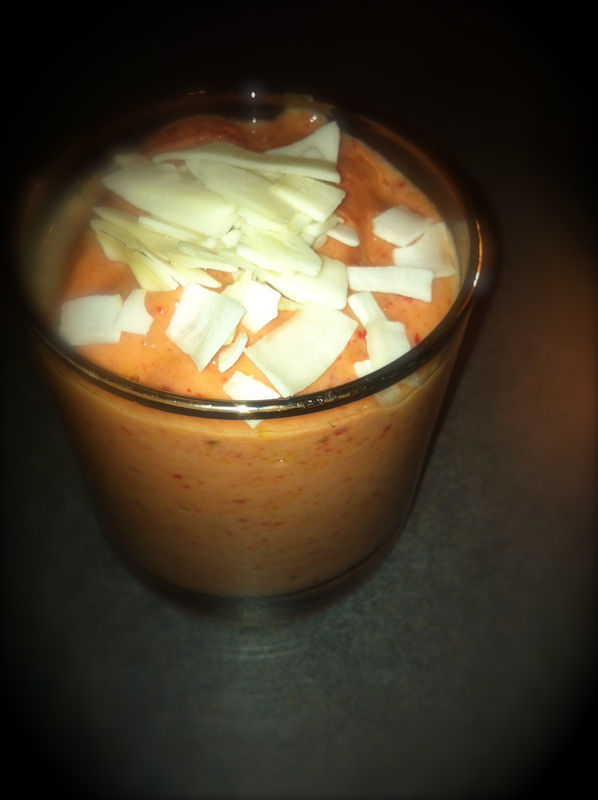 Throw all of the ingredients into your blender except the coconut chips and blend until you reach desired consistency. Top with the coconut chips- I bought these at Trader Joe’s based on a recommendation from my friend Emily– and I fell in love. They are awesome! If you don’t have these available, try adding some chopped walnuts for crunch. Whether you are in a “convenience rut” or not- is there something in your diet that you are currently eating every single day? Let me know in the comments below!